To call our Attention, amuse and surprise ! 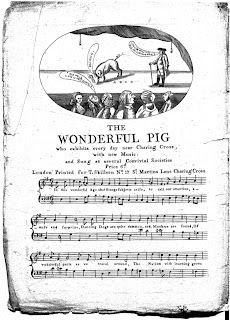 A few years later, in 1795, another comic song -- or, possibly the same one -- was sung at a Boston theatre, following the plays "The Wonder" and "The Farmer," featuring Mr. Jones as "Jeremy Jumps, in which character he will introduce the satirical song of the LEARNED PIG," following which, costumed as a wingèd Mercury, he would "fly from the back of the stage to the extremity of the gallery, and back again." One wonders if the pig flew with him. And today, I'm happy to note, the Learned Pig is making a sort of theatrical comeback. 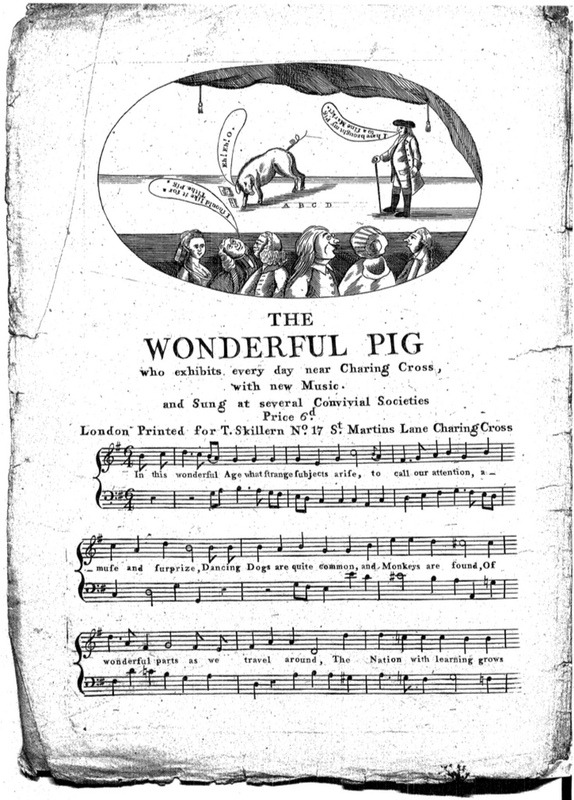 It began with Daniel Freedman's 2011 musical "The Incredible Adventures of Toby the Learned Pig," which débuted at the Wonderland One Act Festival on 42nd Street in New York; songs for this play included "London Town" "Swine," and "The Cat's Opera," and all can be heard and downloaded from Mr. Freedman's MySpace page. And, in 2013, it will continue when the Fittings company of Manchester presents "Edmund, the Learned Pig" at the Royal Exchange Theatre, with music by the Tiger Lillies' Martyn Jacques and a script by Mike Kenny, best known for his stage adaptations of Edith Nesbit's Railway Children. It's to be based on the Tiger Lilies' song, which in turn was inspired by the late Edward Gorey; you can hear the original version here. It only seems fitting that, as Toby himself was born in Salford, that the return to stage of pig who can spell should take place in Manchester.